Common Questions About Offers And The Answers! Q: What makes an offer a cash offer? A: The short answer is CASH. A larger number of properties are selling for over the asking price with multiple offers. The litmus test of the buyer comes at the offer stage. If a buyer needs a loan to complete the purchase, the buyer attaches to their written offer an up-to-date pre-approval letter from a reputable lender for the loan amount. In the Cambridge and Somerville market, many buyers are cash buyers. Cash buyers present proof of funds for the full purchase price or more with their offers. 1) Pure all cash buyer who has the amount of the purchase price or more in cash on hand and truly pays cash – very rare. Proof of funds presented and cash paid. 2) Buyer who has proof of funds equal to or in excess of the purchase price and who submits proof of funds with offer – however, buyer still gets a loan set up by closing. Please note that proof of funds is usually a letter from a financial institution or a financial advisor OR redacted bank statement(s) or redacted investment account statement(s) that equal or exceed the purchase price. Some buyers without proof of funds who must get a loan to purchase a property are still dropping their mortgage contingency in order to make their offer more attractive. This is risky, because if the loan is not approved, you risk losing your purchase and sale deposit (typically 5 to 10% of the purchase price). These buyers attach a pre-approval letter instead of proof funds. In this sense, they are not really cash buyers. And yet they are still willing to drop the mortgage contingency from their offer. Risky. If you plan to drop the mortgage contingency from your offer, you really need to understand that your offer is not contingent upon the loan being approved and therefore you need to understand what you would do if the loan you are seeking is not approved. For example, if you are seeking a loan of $400,000 on a purchase price of $500,000, what happens if the loan for $400,000 is not approved? You need to address this question with your lender up front. Please note that buyers who remove the mortgage contingency from their offer but who are still planning on getting a loan, are buyers who are usually very certain about the lender they will use and have developed a very clear understanding with their lender of how they will handle any and all situations that may arise and have a plan in place for all possible scenarios. Q: What is an escalation clause? A: The short answer is that an escalation clause, sometimes called an escalator, is a clause included in an offer where the prospective buyer states that they will pay X amount more than another bona fide offer. The Cambridge and Somerville market has been hot, hot, hot since the middle of 2012. The average sale price in both Cambridge and Somerville is over the asking price. Multiple offers on a property for sale in Cambridge or Somerville is fairly common. And now and again, an offer with an escalation clause is presented. Let's say the property is 123 Main Street and the list price is $500,000. 123 Main Street receives multiple offers. A prospective buyer for 123 Main Street bids $530,000 and includes the escalation clause above, indicating they will increase their offer by $5,000 above any written bona fide offer that is higher than their own offer ($530,000), not to exceed a purchase purchase price of $545,000. Say the Seller of 123 Main Street receives a higher written bona fide offer for $537,000. The escalation clause would then kick in, taking this offer for $530,000 to $542,000. It's worth noting that this particular escalation clause includes a YES/NO choice for the prospective buyer to indicate whether they will proceed with the Contract without regard to the amount of the appraised valuation. Interesting! In this example the prospective buyer has selected NO, indicating that the appraised valuation does matter for this prospective buyer. This likely means that this prospective buyer does not have additional money to put down for a larger downpayment, in the event that the property appraises for less than the purchase price and the lender is only willing to approve a loan for a percentage of the (lower) appraised value rather than for a percentage of the (higher) agreed upon purchase price. It is unusual for an escalation clause to be this detailed. That being said, everyone involved in the transaction ought to be thinking about what the prospective buyer will do if the property appraises for less than the agreed upon purchase price. If the property does appraise for less than the purchase price, then for the deal to survive a) the Buyer is going to have to make a larger downpayment or b) the Seller is going to have to reduce the purchase price or c) some combination of a and b. Of course, this presupposes we are talking about an offer with a mortgage contingency. If this is a cash offer, we are not having this discussion at all because the Buyer has the money - the cash - to complete the purchase without a loan. Make sense? Some listing agents and some Sellers do not like offers with escalation clauses. Indeed, some listing agents even post on the property listing in MLS that the Sellers do not want to review offers with escalation clauses. If you are considering using an escalation clause, you are likely not helping your cause if the listing agent has made known Sellers do not want to review offers with escalation clauses and you present an offer with an escalation clause. As a top agent in Cambridge and Somerville, I have seen my fair share of escalation clauses over the years. At the present time, I am finding it is taking the best offer a prospective buyer can make for the prospective buyer to have a shot at winning a property in a multiple offer situation. That being said, an escalation clause is something to be aware of and to contemplate. An experienced agent can offer guidance on this topic. Get the guidance you need. Q: What is the Massachusetts Mandatory Real Estate Licensee Consumer Relationship Disclosure Form? A: The short answer is that it is a form that you are to receive at your first personal meeting with a real estate agent. The form makes known to you if the real estate agent presenting the form is a seller's agent, a buyer's agent, or a facilitator. The form was revised in January 2017. It takes the place of another version of the form that had been in use for over ten years. Although the form appears daunting to some consumers at first glance, it is fairly straightforward upon closer inspection. Be sure to ask the real estate agent presenting the form to answer any questions you have about the form. For most sellers, the real estate agent is the seller's agent. For a seller, generally speaking the real estate agent will be the designated agent for the seller. For most buyers, the real estate agent is the buyer's agent. For a buyer, generally speaking the real estate agent will be the designated agent for the buyer. Please note it states at the top of the form that THIS IS NOT A CONTRACT. That is true - the form is not a contract. It is, as its name makes known, a disclosure form. • The back side of the form includes definitions for seller's agent, buyer's agent, non-agent facilitator, designated seller's and buyer's agent, and dual agent. Review the definitions on the back side of the form and ask the real estate agent presenting the form to you to answer any questions about these defined terms. • Although the real estate agent presenting this form is required to sign it, you the consumer are not required to sign it. Note there is a tick box at the bottom that is to be checked if the consumer declines to sign the form. • You are to receive a copy of the form after it is presented. • A real estate agent is not required to present this form to you at an open house. Rather, the requirement is that the agent present the form to you at the first personal meeting with you to discuss a specific property. As a Realtor, when I have a personal meeting with someone for the first time and present this form, I am often told by the person receiving the form from me that other real estate agents the person has met with did not present the form. This is unfortunate. The law requires that that you the consumer are to receive the form at your first personal meeting with a real estate agent. The form makes known to you if the real estate agent presenting the form is a seller's agent, a buyer's agent, or a facilitator. It's good to know the role of the agent you are speaking to. Hence the requirement of the state of Massachusetts that the form be employed. Q: What is a home inspection contingency? A: The short answer is that a home inspection contingency is a contingency in your offer that indicates your offer is contingent upon a satisfactory home inspection. 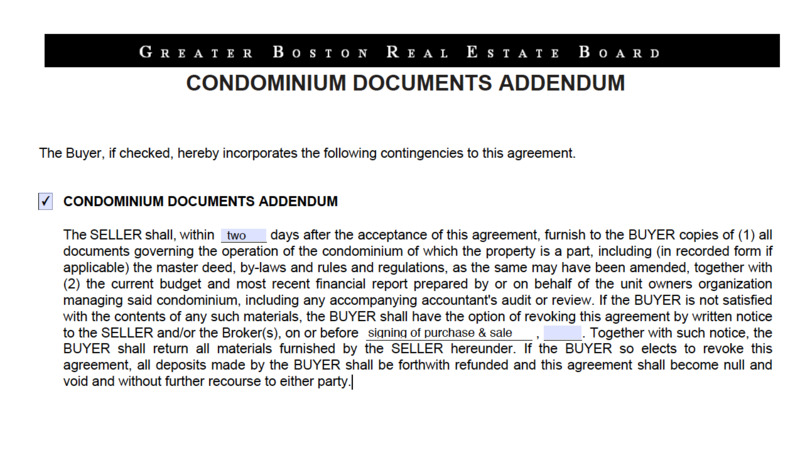 Generally speaking, in the Cambridge and Somerville market that I work in, a Buyer is given something like five business days after offer acceptance to have the property inspected by a duly-licensed person engaged in the business of conducting home inspections, and then must indicate no later than the day following the last date the property can be inspected if they are exiting the transaction based on the home inspection. Note that the inspection contingency clause included here asks the Buyer to indicate the dollar amount of serious structural, mechanical or other defects that may occasion the Buyer to exit the transaction. Some buyers insert $0 or $1 in this blank. Others put $1,000. In a competitive bidding situation, some buyers may choose to put a figure like $5,000 - or an even higher number. The market has been very hot in Cambridge and Somerville, and very often multiple offers is the norm. As a result, some Buyers will remove the home inspection contingency from their offer, seeking thereby to make their offer more attractive to the Seller. Some Buyers will remove the inspection contingency from their offer and simply not have a home inspection. Please note that if you remove the home inspection contingency from your offer, you should not expect the Seller to grant access to the property for a home inspection after offer acceptance. Some Buyers will have a home inspection before offers are due. I recently had a listing where four prospective buyers had pre-offer home inspections. Some Buyers will have a pre-offer consultation with a home inspector before offers are due. As a Buyer, you need to decide what you are comfortable with regarding the home inspection contingency clause. I never recommend that a Buyer remove the home inspection contingency clause from their offer. That being said, everyone understands that in a multiple offer situation, having a home inspection contingency clause in one's offer can make it more challenging to be the winning bid. When you make an offer in Massachusetts, you are required to receive the Home Inspector Consumer Fact Sheet. Be sure to review this document. Your Buyer's Agent ought to be giving you a copy of it when you are making an offer. It's important to note that by definition the home inspection contingency clause affords the Buyer the right to exit the transaction. The home inspection contingency clause does not by definition afford the Buyer the right to renegotiate the purchase price based on findings. For sure, if the inspection uncovers a serious issue previously unknown, the Seller may be open to negotiation. However, it is important for a Buyer to remember that the Seller is not obligated to enter into negotiations after the home inspection. It's especially true in a hot Seller's market that most Sellers are resistant to renegotiating after the home inspection based on findings. Q: What is the condo docs and budget review contingency? For an offer on a condominium, a condo docs and budget review contingency - with said review to be completed by the time of the signing of the purchase and sale - is a standard contingency. In my own experience, I cannot imagine that this contingency being removed will be the deciding factor for a seller in a multiple offer situation. It is a standard contingency. That being said, some buyers are removing the condo docs and budget review contingency from their offers. Amazing! The fact of the matter is that when an offer is made, it is not always the case that all the documents governing the operation of the condominium of which the property is a part AND the current budget/financials for the association are readily available to the prospective buyer. Even if all the documents and financial reports are available, the prospective buyer very likely lacks the expertise to conduct a proper review of these items. In our marketplace, the norm is for a Buyer to retain a buyer's real estate attorney after offer acceptance. One of the first and most important tasks a buyer's attorney undertakes for a Buyer with an accepted offer on a condominium is the review of the condo docs and budget. This takes time. As an experienced agent involved in many condominium transactions since 1999, I have seen offers without a condo docs and budget review contingency. It never ceases to amaze me when this contingency is left out of an offer on a condominium. I don't recommend leaving this contingency out of an offer on a condo. Interestingly enough, buyer agents who work in markets that don't include many condominiums sometimes forget to include the condo docs and budget review contingency in an offer on a condominium. Not good! The condo docs and budget review contingency is an important contingency, because reviewing the condo docs and budget is important step in the process of purchasing a condo. It is not uncommon for a buyer's real estate attorney to conduct a condominium document and budget review for a buyer client without a condominium documents and budget review contingency in their accepted offer. Remember, though, that in this scenario the Buyer cannot exit the transaction based on the condo docs and budget review, as the Buyer's offer does not include a condo docs and budget review contingency. Again, not good! What if the condo you are making an offer on is part of a new condo conversion or a new construction unit and the condo docs and budget are not ready yet? Good question! You still would want to include a condo docs and budget review contingency. Indeed, one could make an argument for the condo docs and budget review contingency being even more important in this scenario. If the condo docs and budget are not ready by the time of the signing of the purchase and sale agreement, the condo docs and budget review contingency survives in the purchase and sale agreement. Typically, the Buyer and the buyer's attorney enjoy something like a seven-day period of review once the condo documents are conveyed. It's fairly typical for there to be some back and forth on the language in the condo docs when it is a new conversion or a new construction association, unless it's a much larger association and the condo docs are already in final form and have been recorded. Cambridge and Somerville have been hot real estate markets since the middle of 2012. Multiple offer situations are quite common. Many buyers are dropping contingencies from their offers to make them more attractive to sellers. If you are making an offer on a condominium, I strongly encourage you to preserve the condo docs and budget review contingency in your offer. In my own experience as a top agent, I have never seen the condo docs and budget review contingency be the deciding factor in a seller's decision-making regarding which offer to accept. The condo docs and budget review contingency is a standard and important contingency in an offer on a condominium. The norm is for the the condo docs and budget review to be completed the the signing of the purchase and sale agreement. If you are a Buyer, give yourself and your real estate attorney that much time to review the condo docs and budget. It's important. Q: What is the lead paint form? On his Massachusetts Real Estate Law blog, real estate attorney Richard Vetstein has written an excellent blog post about the lead paint law disclosure requirements. A buyer ought to receive the Property Transfer (Lead Paint) Form properly filled out and signed by the seller and listing agent, as well as a copy of the lead paint booklet BEFORE making an offer on the property. Both the buyer and buyer's real estate agent will be involved in completing the Property Transfer (Lead Paint) Form received from the seller via the listing agent, with both buyer and buyer's agent signing and initialing where appropriate. Real estate agents must tell prospective purchasers that under the state lead law, a new owner of a home built before 1978 in which a child under the age of six will live or continue to live must have the home either de-leaded or brought under Interim Control within 90 days of taking title. The Property Transfer (Lead Paint) Form affords the buyer the opportunity to receive or waive the opportunity to conduct a risk assessment or inspection for the presence of lead-based paint and/or lead-based paint hazards. A buyer is advised to visit www.mass.gov/dph/clppp (then click on "Database of Lead Inspections for Homes in Massachusetts") to determine if there has been a previous lead paint inspection of the property recorded by the Massachusetts Lead Paint Database. Remember, if you are interested in pursuing a property that was built before 1978, you are to read the lead paint booklet and receive, review and complete the Property Transfer (Lead Paint) Form for the property presented by the seller, usually via the listing agent.